Yes, this is another one program for creating .xml files for FOMOD instalations. Translation to Chinese, complex and simplified by ThekingdomSCH﻿. Translation to Chinese, complex and simplified by 332671403﻿. - File and folder selection now support multiselection. - Auto-correction of destinatination path now recognize *.esl and *.ba2 files, and 'MCM' folder. - Fixed bug on window minimizing. - Fixed bug that crashed program when adding plugin dependencies. - Fixed bug where files priorities in conditional installations didn't save. - Fixed bug which caused ghosting items in required installations table when merged two FOMODs. - Added Chinese translations by ThekingdomSCH﻿ and 332671403﻿. Complex and simplified. Four in total. Choose any. FOMOD CT now more Chinese as never before. - Updated mods category list. - Updated ReadMe file with redacted by Valyn81 version. - Added mod header image feature. - Added file/folder priorities feature. - Added ability to change plugin group type from context menu. - Added ability to change file/folder priority from context menu. - Added limited UTF-8 support. XML files in this encoding may be opened, however non-english symbols may be interpreted incorectly. Saving will still be in UTF-16. - Mods now can be created with zero steps count. By default when new mod created it has one step, but this step may be deleted. In this case required and/or conditional installations fiels must be filled. - Mod/plugin description fields should behave less bizzare. Symbols '<' '>' '&' (new) and new line symbols will be replaced inside programm memory and replacements will not be seen untill plugin re-selected. - Re-sorted tab order. Tabbing between controls now should have common sense. - Added auto paste &#13;&#10; codes for new lines and &#60; &#62; for < > symbols. - Fixed error in case executable was launched without any featured files like language file, config and splash screen image. - Fixed bug where puting '?' symbol in gpoup/plugin name cause error on reopening fomod. - Fixed bug where required installation file list wasn't cleared when creating new fomod or (re)opening. - Fixed bug where an error occurred when deleting file from conditional installations. - Fixed bug where you can't change step name. - Fixed rare bug caused false positive check 'out of root directory' when added file to mod that was opened through 'Recent' of 'Open file' menu. - Added operator choice in step visibility conditions tab. - Fixed bug causing crash when remove file from list on some machines. - Fixed bug: mod information didn't saved if edited. - Fixed bug when destination path not cuted automaticaly. - Fixed bug when application started between screens on multi monitor systems. - Added splash screen, because reasons. - Added multi language support and language files. - Added list of recently opened/saved fomods. - Added drop down list of mod category. - Fixed bug with messed up visibility conditions. - Fixed bug with error when adding plugin dependency. - Added required instalations support. - Added conditional instalations support. - Menu 'FOMOD->Open' renamed to 'FOMOD-Open folder'. - Added 'Open file' menu option. Work almost same way as "Open folder' but allow you to specify files instead of folder. - Added Merge FOMOD. Allow you to merge two fomods. - Improved stability when opening fomods. - Improved stability when opening image file. - Interface now should look better on screens with high resolution. - Added scroll bars for mod description and plugin description fields. - Added file lists auto-scrolling. - Fixed bug when select file in list on Windows 10. - Added plugin dependencies support. - Added popup tooltips for group/plugin/file lists. - Added context menu for group/plugin/file lists. - Added save confirmation splash screen saying that ererything is OK, or not everything is OK, or saying that everything is wrong, or saying nothing if things go realy bad. - Fixed bug where program failed to load plugin if it image path incorrect. - Fixed bug where mod info field not cleaned on FOMOD->New command. - Slightly rearranged interface to fit new stuff. - Unicode text save/load files. Uses UTF-16 (UCS-2) Little Endian encoding. Read more about save/open in ReadMe. - .xml file reading improvements. Should read correct if xml tags splitted in several lines. - Mod description and plugin description fields can contain multiline text. However it doesn't mean that in NMM (or any other fomod installers) your description will be multilined. Use some special codes or BB codes to do so. - Script thing reworked, now it creates .bat file. Read more about it in ReadMe. - Automatic folders detecting in destination path, like 'textures', 'meshes', 'sound' etc. 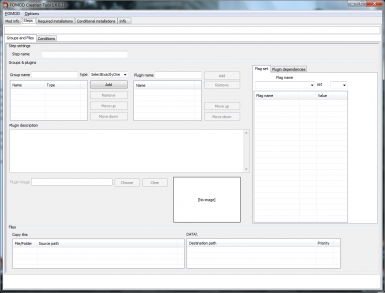 - Editable plugin names, editable group names. - Coded 'Exit' menu. Yeah, in version 1.1 i forgot to add any code to it. - Removed "Done" button, instead of it there "FOMOD->Save" menu. - Added Open function. For opening fomod you must specify root catalog where 'fomod' folder and .xml files is. - New function: script commands before and after save. In fact it's a windows console commands with some macro. May be usefull for auto packing in archive. - Added 'SelectAll' plugin group. Recently i made two FOMOD installations, one i made manually from scratch, another one with SimpleFOMOD program and manual editing. And both times it took several hours to make work with NMM. It just a little bit less time then i spend on making mod itself! Ridiculous! 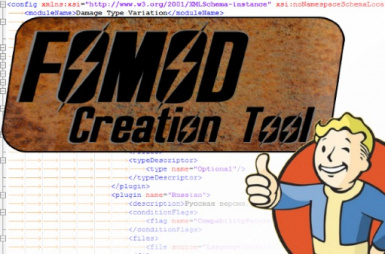 I wasn't satisfied with functionality that provide SimpleFOMOD and, of course, i didn't want to spend hours on making stupid .xml manually... so i decide to make my own fomod creation tool with blackjack and hookers steps and conditions! That's right, with this program it's possible to make multi-step installations with conditions. I tried to not overload interface with controls, but it's harder to do than say. I'll not post here wall of text about how exactly to use the program, you may find this information in ReadMe file, or right in the program. As far as i know right now program cover 99% of fomod specification. There is a long-long list of what was added and removed in changelog tab. Chinese - complex and simplified by ThekingdomSCH﻿. Chinese - complex and simplified by 332671403﻿. German - automatic translation with google translator. French - automatic translation with google translator. Japanese - automatic translation with google translator. Copy any existing language file in 'Language' catalog. Set name of this copy to correspond language you are about to translate. Open it any text editor you prefer, select all and cut. Open any translator that support whole text translation. For example google translator. Past text to it. Don't forget to specify languages from and to which you translating. Check the result. Keys should not be translated, the file should save it structure key = "value" where only value should be translated. Manually edit translation if needed. Copy your translation and past it to a copied file, save it. Now yoг can choose this language file from settings window in FOMOD CT.
Support unicode xml files in UTF-16 (UCS-2) Little Endian encoding only. Stand alone executable. May run without any assets if needed. If you paranoid one and don't trust .exe file then you may download source file in miscellaneous section, download Builder and compile everything yourself.